British Columbia has some of the best drinking water in the world, but following the unusually warm and dry weather of 2015, many communities are ramping up their water conservation efforts to ensure that this water remains in good supply. The District of West Vancouver recently launched a contest to engage local youth in water conservation efforts, so we sat down with Aaron Bichard from the District’s Engineering Department to find out more. The District of West Vancouver decided to take a new and creative approach to engage youth in their water conservation program and launched a video contest for West Vancouver students to share the unique ways that they can make a difference. The District of West Vancouver is facing many of the same issues as other communities throughout Metro Vancouver when it comes to water usage. First, a perception of plenty can make residents take drinking water for granted. “Metro Vancouver is known for rainy winters, however the rain we get in winter has to last us through the drier summers when we may get little rain for months,” says Aaron. Second, because of this perceived abundance, many people don’t notice all the ways we waste water each day. “During the summer our water consumption more than doubles, mostly because of optional outdoor water uses such as watering the lawn, washing the car, or hosing off the driveway,” says Aaron. Third, unidentified or unrepaired water leaks can contribute to significant water loss. “With metered water, residents are able to monitor their own water use, which can help them identify leaks that may have otherwise gone unnoticed,” says Aaron. The contest is open to Kindergarten to grade 12 students who live in West Vancouver and/or are enrolled in a West Vancouver school. By capturing the youth perspective through the contest, the District hopes the videos can inspire new ways to reduce water usage, especially during summer months, and encourage a new generation to appreciate the water resources many of us take for granted. 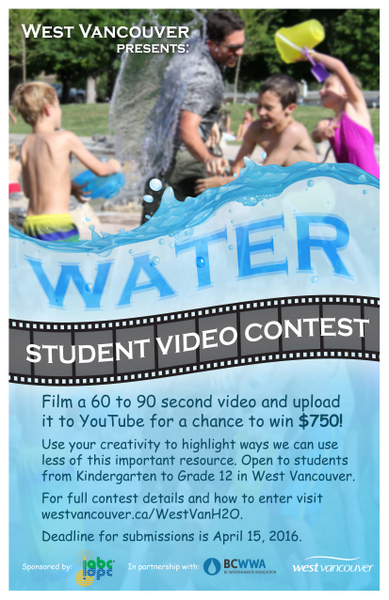 Students have until April 15, 2016 to submit their videos and the winner will be announced in May during BCWWA’s BC Water Week (May 1-7). To enter, students should create a 60 to 90 second video, post it to their YouTube channel and share the link with the District for the chance to win a $750 cash prize. For more information on the contest, including entry details, please visit westvancouver.ca/WestVanH2O. If your community has a new or creative program to encourage residents to conserve, protect and support BC’s water resources and systems, tell us about it! Email communication@bcwwa.org.